With increasing industry emphasis on providing both rapid and robust processes, companies are reaping the benefits of new tools for risk management and process analytical controls. As a current example of these approaches, Fujifilm Diosynth scientists have accelerated the development process from gene to finish by shortening the timeline, incorporating quality by design (QbD) principles, and designing the process to be as robust as possible. When the Apollo mammalian expression cell line was introduced three years ago, the time from gene to investigational new drug application (IND) took 18–24 months. Through new tools, approaches, and innovations, the company has shortened that time to 15 months or less using rational program design (Figure 1). 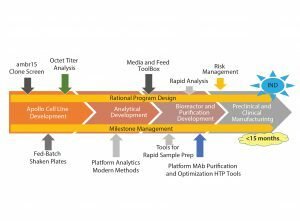 The first step was to make cell line development robust and create tools for more efficient upstream and downstream processes. Analytics play an important role and have been designed alongside the processes to enable quick and robust methods for process testing. Finally, approaches for active project management, risk management, and mitigation enable reliable development and manufacturing. The first step in working with contract manufacturing clients is to define goals and a timeline using a phase-appropriate matrix for guiding projects through development phases. It is used not only by scientists to make correct decisions, but also as a tool to facilitate conversations with clients about where their project is heading. The importance of defining these end goals needs to be emphasized to clients, especially for those anticipating accelerated approval of a product. When Fujifilm Diosynth developed its Apollo cell line, the original goal was not a high titer, but to develop a cell line suitable for manufacturing that could be used all the way through commercialization. The key consideration was developing a platform medium for the cell line that could accelerate upstream process development. Scientists looked at the entire process from development to manufacturing. One development bottleneck they discovered was cell banking. Very often, it is disconnected from and therefore delays process development. The company built its own cell banking facilities that are now available when needed. When developing tools for cell line development, two major innovations were implemented. Moving away from the static batch plate, the company introduced a fed-batch steered plate. Also, the ambr15 system disposable automated microscale bioreactor system replaced shake flasks. Cost-effective microbioreactors work like classical bioreactors at microscale (10–15 mL). The fed-batch steered plates performed similarly to the shake flasks when used in a format of multiwell plates with a small amount of culture. This format saved time on both cell growth and screening a large number of samples. Using the ambr15 system for the final cell clone selection, scientists focused not only on cell growth and productivity, but also on product critical quality attributes, knowing that the product profile is critical. 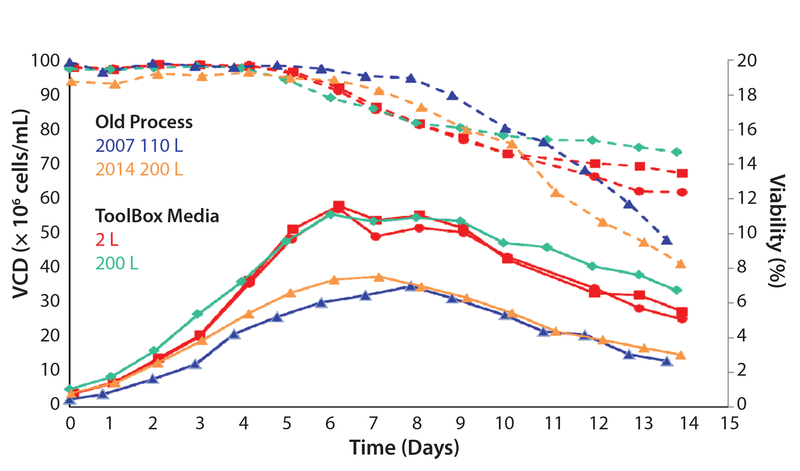 Cell line development was reduced from nine to six months. 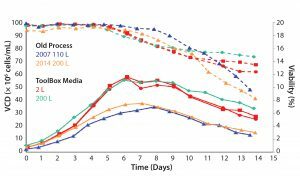 To develop our innovative Media–Feed toolbox, we screened 63 media and 19 feeds with 15 Chinese hamster ovary (CHO) cell lines to find the best performing media/feed combinations. Using a high-throughput analytics system (Tecan) and rapid analysis, we tested different combinations with different clones. The Media–Feed toolbox is based on the four most promising combinations. As part of the clone selection process, scientists can quickly test multiple clones in bioreactors with such an optimized toolbox. The clones chosen have the greatest viability and quality attributes. Using the toolbox is rapid and efficient because it screens the different combinations and produces a limited number of finalists to be tested. In 2007, a good process produced titers of 2.5–3 g/L. 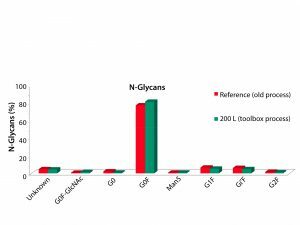 After the Media–Feed toolbox was applied to this process, cell-line productivity and viability were increased. No impact to critical quality attributes occurred (Figure 2). 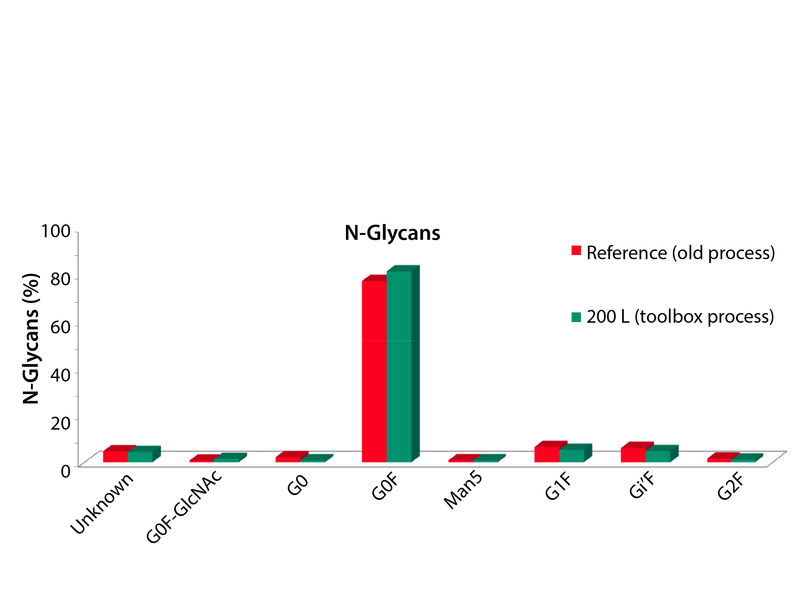 Comparing a number of quality attributes, such as glycan profiles (Figures 3 and 4), showed that the new and old processes gave comparable results. The company doubled an original titer to over 5 g/L using this limited screening with the toolbox (Figure 5). For downstream process development scientists also use high-throughput purification (HTP) techniques. In one example, they applied a rapid scale-down approach identifying windows of operation for hydrophobic-interaction chromatography (HIC) column screening. They looked at buffer conditions during elution, including ammonium sulphate concentration, pH, protein concentration, and protein stability. Screening was conducted using a plate-based format. It was fully automated and took only 30 minutes to set up. Optimum conditions for ammonium sulphate were at 0.9 M, where solubility was largely independent of protein concentration. For pH, the material was most soluble in a pH range of 6–8. The optimum conditions were applied to HIC robocolumn screening. Five different resins in the chromatography columns were screened at three pH levels (6.0, 7.0, and 8.0) using automated systems. With decreasing pH came a later, sharper elution. The HTP advantages included using 50× less feedstock and 25× less buffer, and the process was 12× faster than previous methods. Screening would be impossible without good analytics. Fujifilm Diosynth has created comprehensive analytics in-house for every step in process development and continuously updates its analytic capabilities with the newest technology. 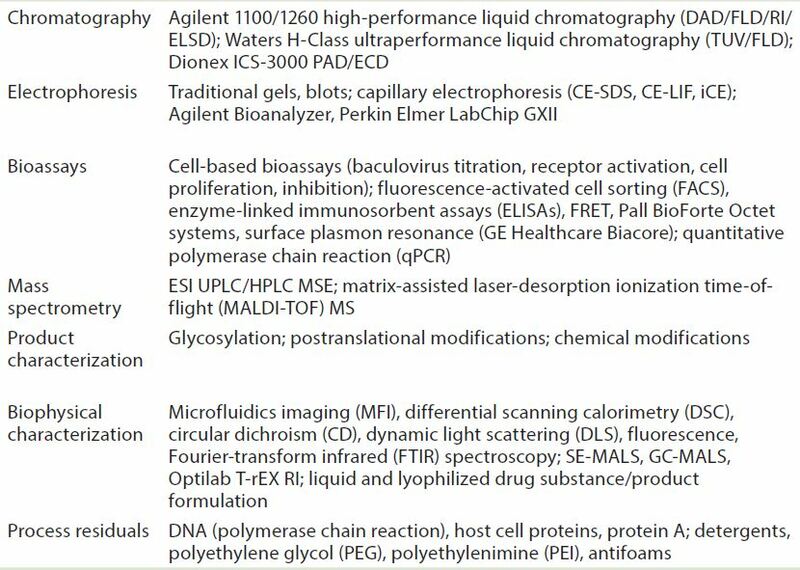 Throughout QbD process development using higher throughput analysis, the company looks comprehensively at protein quality attributes, including charge heterogeneity, glycosylation heterogeneity, aggregation, oxidation, fragmentation (hinge clipping, truncation), acylation, glycation, disulphide scrambling, half antibody, and other attributes (see Analytical Tools box). Rapid product-quality evaluation requires high-throughput analysis. Product quality attributes are monitored throughout process development (QbD). Example attributes include charge heterogeneity and glycosylation heterogeneity; oxidation, aggregation; hinge clipping, truncation, acylation, glycation; disulphide scrambling and half antibody. 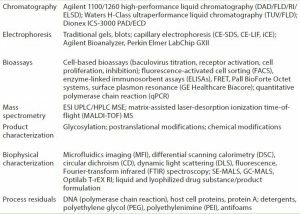 Such tools drive process development with rapid analysis, enabling up to 48 samples per ambr 15 set, with testing over the last three to five days of culture; purification DoE studies; and evaluation of multiple quality attributes (titer, aggregation, charge variants, truncation/fragmentation, glycans, residuals). Up to 200 analyses can be generated in two hours. A large number of samples can be generated (usually testing over the last three to five days of culture) that are analyzed with a wide range of tools. Commonly, 200 samples are generated in two hours followed by rapid analysis of the samples at less than 10 minutes per sample, per test. Scientists get data the same day of testing and can then rationally design the next step in the process. This is a good example of using QbD to drive the process through data and analytics (Table 1). To shorten the timeline, Fujifilm Diosynth shortened experiments and analysis while at the same time adding complexity to the process and generating much more data about molecule behavior than in the past. Next, effective program management was needed with systems to set and track milestones in the process. Part of program management is identifying and mitigating risks. Before starting a project, analysts perform a problem analysis for potential problems together with a risk assessment and determine how to mitigate any risks. Designing a platform-ready system can reduce risks with a focus on things that are different such as different molecules and cell lines. Specifically, analysts look at project elements that are new, unique, or difficult by using risk-identification tools, potential problem analysis, and a risk ledger. They can then develop risk mitigation with focused training and visual management tools. Finally, every important milestone in the process is stage gated. Before each step, the entire team reviews the progress and votes on their readiness to move forward to the next stage. Fujifilm Diosynth reached its goal of shortening the gene-to-IND timeline to 15 months. 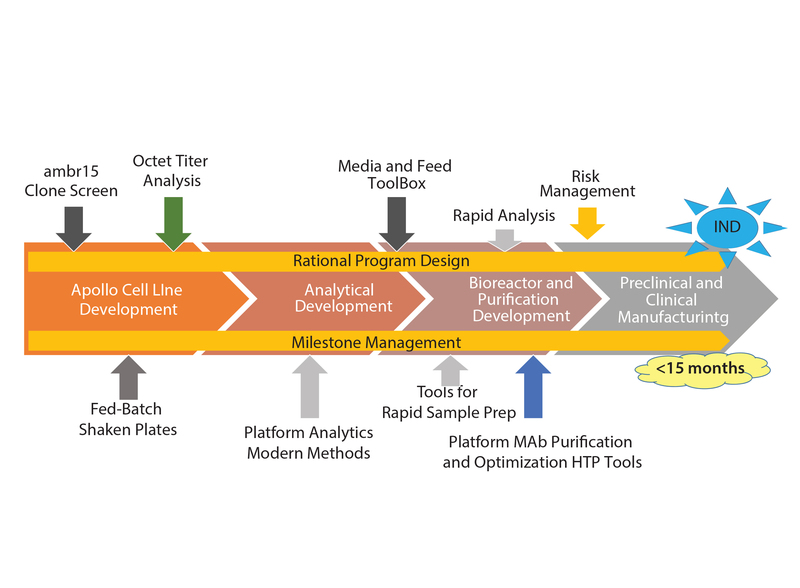 In that process, it generated robust processes by using tools for cell line development, clone screening, optimized upstream and downstream processing, and rapid analysis while implementing QbD principles. These different tools allowed the development time to be halved while generating a great amount of information about the cell line development and molecule behavior. Jozef Orpiszewski, PhD, is senior director of program design for Fujiflim Diosynth operations, jozef.orpiszewski@fujifilm.com. This article was adapted from a presentation in the BPI Theater at the 2016 BIO International Convention.